The emu is the second largest bird, being 5 to 6 feet tall, 7 feet long, and weighing up to 120 pounds. It has loose, hairlike, brownish-gray feathers tipped with black. The crown of the head and neck are black, and the head feathers appear to have a center part. The sides of the head and neck are bright blue. “Flight” and tail feathers are indistinguishable from the rest of the plumage. There are only about 6 or 7 wing feathers. The eyes are large and protected by a nictitating membrane. Eyesight is keen and hearing is good. 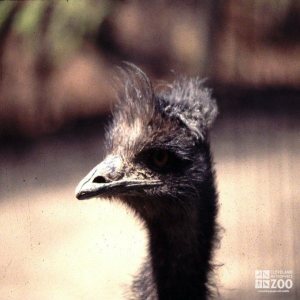 The emu has played an important part in aboriginal culture. The range of the emu is the continent of Australia. Emus inhabit open plains and Eucalyptus forests. Emus live in pairs or small groups of one male and several females. They spend the day foraging for the wide variety of food they eat. They swim well and can run at 30 mph for some distance. When captured young, they can be made into friendly pets. In captivity they recognize their keepers and may respond to them. They can do without water for short periods by eating juicy foods but prefer water daily. There seems to be a recognition and a caring for one another within the flock. Emus pair in December and January, then lay eggs from April to June. The emu’s nest, placed under bushes, is merely a trampled mass of vegetation into which the eggs are deposited by the hen. The eggs are large, colored green, which later turn to black. The male then incubates the eggs and takes care of the young after hatching. It is the hen’s duty to defend the nest during the incubation period, which varies in length depending on how much brooding the parents do. The chicks are striped longitudinally with black, brown and cream. They grow quickly to adult size, but take 2 or 3 years to mature sexually.